Auto De Fe - "The Spectre"
Secret Eye are swiftly establishing themselves as one of the leading labels in the freak folk scene, and that's because they find bands like Auto De Fe. Auto De Fe are, at heart, a folk group, utilizing traditional European-style folk melodies, but building their sound using numerous acoustic instruments that are not so traditional to European folk such as: guzheng, yang quin, marimba, Tibetan cymbals, tambur, Chinese banjo, and bouzouki. The result is a fascinating blend of drones, bowed sounds, string picking, vocals and percussion that sounds at once time-honored and traditional, and at the same time exotic and psychedelic. The band mixes vocal oriented tracks like the spacey dronefest of the opening song Past Times to the lilting weird balladry of Child of Typhoon to the old European sounding Huar Weishenme with instrumental cuts like the mesmerizing Asian tinged, psychedelic jam of the title track to the menacing punch of the throbbing Just Now to the haunting, dark and atmospheric Tea House Tragedy. The band achieves the tricky balancing act of having its own unique and consistent sound but where every song is nonetheless distinctive and original. 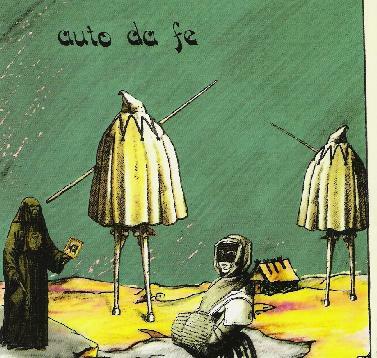 With their singular East meets West concoction of sound, Auto De Fe produce, in The Spectre, a strange, yet warm and inviting listening experience.